You’re probably wondering what on earth today’s title is all about. But no, today was a day I’ve been looking forward to for months, the day I get to meet one of my online friends, Thom, in real life! Yay! We met through a forum for Farmville (of all things lol!) 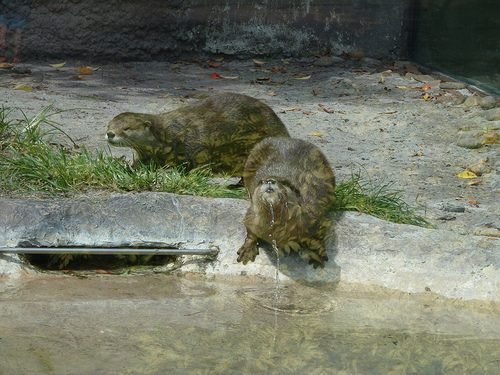 and there were a few of us that hung out in the Off Topic forums, dubbing ourselves OT’ers…which then turned into Otters lol. We all became good (albiet long distance!) friends and chat on Skype as well as via Facbook. I’ve been lucky enough to meet a couple of Otters, one who lives not too far from me and another who was stopping in London on her way home to the US. Thom lives in Florida, and we arranged to meet towards the end of our holiday as it fitted with both our schedules. A bit of texting back and forth and we decided on Bahama Breeze as we’d had a nice meal here before. It was like we had been friends forever rather than the first time we met which was lovely. After intros to the family, we went inside and were seated. It was nice to visit a restaurant with natives, as their way of ordering is so different to us Brits, it’s a bit hard to describe, but it’s different lol. We all decided on appetizers. I again went for the firecracker shrimp which didn’t disappoint. This is a photo from the first time I had them, but here again for those who didn’t read that report! Thom and his wife had salads (tropical chicken and shrimp), and Thom kindly offered his plate for a photo since he knows that’s what I do! Both well received. By now it was late afternoon and our friends had to head back home as they had a few hour drive in front of them and work the next day. Thom very kindly paid for the bill and wouldn’t accept anything from us, insisting that we were their guests, so I don’t know how much the total check was for those that were wondering how much you pay for 5 people in Bahama Breeze! We all took photographs to keep the memories alive and to show the rest of the Otters that we did meet – it’s quite often ‘pics or it didn’t happen’ in our group lol. After our goodbye’s we popped into Super Target next door as I needed a couple of things I was running out of and couldn’t eek any more from the well squeezed bottles of toiletries. I also needed another notepad as the one I brought with was now full up with my hand written trip report! Back at the villa, Liam had a play in the pool, whilst we relaxed in the hot tub…certainly the life! I had ended up bringing home my banana dessert as I couldn’t finish it at the restaurant. I yummed it up before we all hopped into bed, ready for our re-visit to Hollywood Studios to get there for rope drop and bag us some Fastpasses for Toy Story Mania!